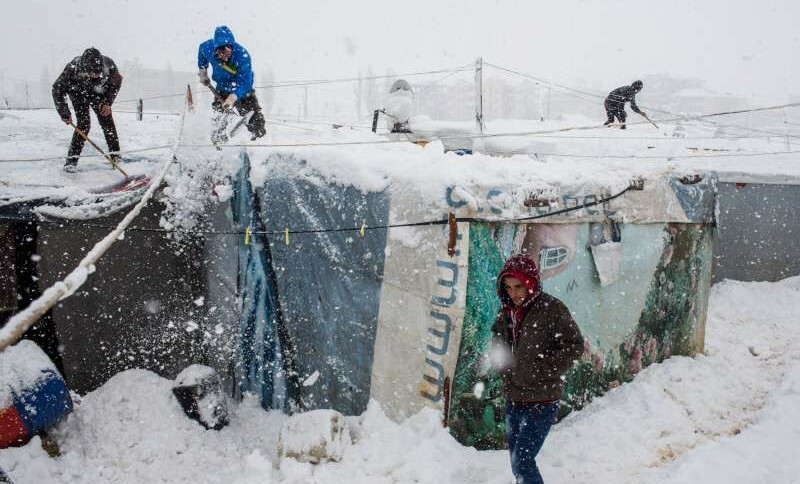 Thousands of refugees across Lebanon and Jordan have been struggling to keep warm and protect their shelters this week as severe winter storms bring plummeting temperatures, heavy snow, strong winds and lashing rain to the region. UNHCR field staff say Lebanon’s Bekaa Valley was blanketed in snow on Wednesday morning, cutting off roads and affecting tens of thousands of refugees – many of whom live in makeshift shelters in more than 850 informal settlements set up in vacant lots, abandoned buildings, garages, sheds and on farmland. Some refugees are managing to get through the storm to UNHCR’s registration centre in the town of Zahle, where they are being processed by staff. Others spent the day huddling around heaters or scraping snow from the roofs of their shelters to stave off collapse. There are reports of damaged homes in informal settlements, where makeshift shelters have collapsed under the weight of snow. Conditions have been particularly bad in Arsal and its outskirts, where altitudes range from 1,300 to 1,400 metres. Six emergency shelters have been set up where UNHCR partners are ready to receive families leaving tented sites, and local municipalities are clearing roads. Across the Bekaa Valley, UNHCR and partners are working to provide people with materials to repair shelters. Plans are also under way to replace blankets, mattresses and other items that have been damaged. UNHCR began its winter aid programme in Lebanon last October, focusing on helping the most vulnerable refugees with cash, stoves and blankets. Winter support also includes fuel vouchers to help people living above 500 metres, including many of those now blanketed by snow in the Bekaa Valley. Plastic sheeting, wood and basic tools to help keep accommodation well insulated have been distributed to almost 250,000 people living in unfinished buildings and informal settlements. Elsewhere in the country, bad weather is affecting refugees living on Mount Lebanon, in Beirut and in the north and south of the country. There are reports that more than 100 tents have been blown over by strong winds in the south of the country. UNHCR’s 600 staff across five offices in Lebanon are working through the storms, although road closures are affecting some operations. The refugee agency continues to work with partners and local municipalities to map needs and coordinate responses. In preparation for the storm, UNHCR reinforced its contingency stocks of fuel, blankets, wood and shelter materials and put inter-agency teams on standby for emergency responses. Meanwhile in Jordan, snow began falling on Za’atari camp around midday on Wednesday following earlier snowfall in Jerash, Irbid and Ajloun as well as other locations with high numbers of refugees. The capital, Amman, is also receiving snow. In preparation for the icy conditions brought by storm Huda, UNHCR has started distributing 20,000 blankets to refugees from Iraq, Somalia and Sudan across Jordan. On Wednesday, UNHCR also distributed 29,000 blankets donated by the United Arab Emirates to Syrian refugees, many of whom live in precarious conditions and are ill prepared for the sub-zero temperatures. UNHCR’s registration centres in Jordan remain open despite the bad weather, and UNHCR’s helpline for refugees is fully functioning. In Azraq and Za’atari camps, a campaign informing refugees of looming storms is under way, and advice provided on safe use of heaters and stoves. Additional blankets are also on their way to Azraq. Emergency shelters are in place in Za’atari, where 20 per cent of the population still lives in tents, although there has been no move to these shelters yet. To help vulnerable refugees living in urban and rural areas survive the winter, UNHCR has given a winter cash grant to 27,000 refugee families to cover essential needs such as heating costs. UNHCR on Wednesday, meanwhile, deployed more than 60 field staff to monitor the situation in sites around Jordan, address the concerns of refugees and organize distribution of additional aid where needed.